The worlds of search marketing and social media continue to collide as Microsoft debuts a ‘new Bing’ featuring a special sidebar filled with information from Facebook friends and other social media networks. PCWorld.com and InformationWeek.com reported on the search engine shakeup that should bring search marketing and social media closer than ever. While the first and middle columns reflect the previous search layout, the sidebar represents the greatest change since it brings social media directly to the search reults page. This sidebar lets users post questions to their Facebook friends, add comments on Facebook, and pin Bing search results to their posts. It also allows users to view a list of friends and experts who may be familiar with the specified search topic based on their prior postings on Facebook, Twitter, LinkedIn, Foursquare, Blogger, Quora, and Google+. In addition, Sidebar has an activity feed featuring posts that Facebook friends have placed on Bing. In the interest of privacy, Microsoft said it has strived to maximize its privacy protections. The company explained that while users are on Bing and signed into Facebook, Bing will only show content that friends could access directly on Facebook. 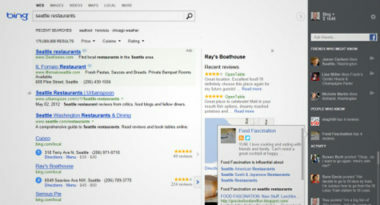 With the new Bing Sidebar, Microsoft is trying to convey the message that social media factors are playing an increasing major role in search decisions. Many are viewing Sidebar as yet another way for Microsoft to compete with Google. Currently, Google has the advantage in terms of search popularity, but Bing’s alliance with a social media powerhouse like Facebook magnifies the issue that Google’s hope to attain social supremacy with Google+ has yet to be achieved. For now, Bing users are awaiting the rollout of this new search-social hybrid and everyone’s watching to see the results. To learn more about Bing Sidebar and the latest ways to use search marketing and social media to capture your audience’s attention, contact MDG Advertising today at call 561-338-7797, or visit mdgadvertising.com. Read more at PC World and Information Week.